Leaving Delhi, you will journey to Agra and its impressive fort. 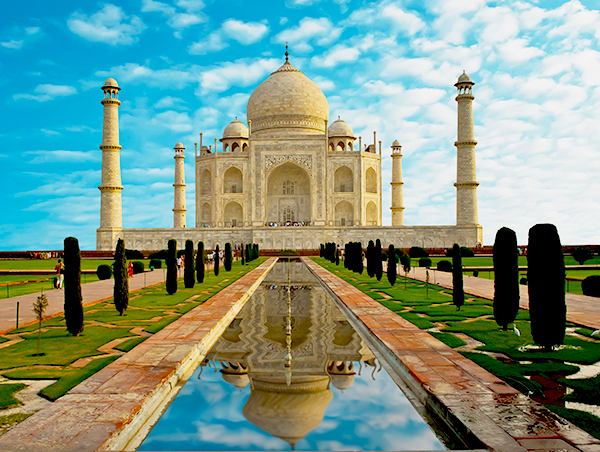 Highlight is Taj Mahal – a monument of love in the world. You will see the sacred city of the Punjab with its spectacular Golden Temple built between 1589 and 1601 and is a superb synthesis of the Islamic and Hindu styles of architecture. The extraordinary building is fashioned from marble, mirror work and gold, which is beautifully reflected in a stunning expanse of water and best seen in the early morning light. This tour takes you to the beautiful hill state of Himachal Pradesh to experience the gracious living in a palace and country manor. In 1903, the Kalka-Shimla railway started making the hitherto arduous journey up much simpler and even today the quaint toy train chugs up steep hill slopes carrying eager tourists. New Delhi visiting Humayun’s Tomb, built by his wife Haji Begum in the 16th Century. An early example of Mughal architecture considered the predecessor of the Taj Mahal. The Qutab Minar - the landmark of Delhi, a huge tower of victory started in 1199 and completed in 1368. The Minar is 72.5m high with a diameter at the base 14.4m and 2.7m at the top. Proceed to the Rashtrapati Bhawan (Drive Pass) once the Viceroy’s residence and now the official residence of the President of India. Designed by Lutyens, it combines western and eastern styles - the dome reflects the Buddhist stupa, the chhattris “Hindu” and the graceful colonnades very “British”. It has 340 rooms. The India Gate (42m), commemorates the 70,000 Indian soldiers who died in the 1st world war. 13516 names of British and Indian soldiers killed in the Afghan War of commemorating Indian armed forces’ losses in the Indo-Pakistan war of 1971. Old Delhi Drive pass The Red Fort (closed on Monday) – the 17th century imposing fortress built in red sandstone is surrounded by a huge boundary wall 33m high. Inside are exquisite palaces and beautiful gardens. Board the 'cycle rickshaw' for a unique experience from the Red Fort, through "Chandni Chowk" or Silver Street, experiencing the sights and sounds of this very busy avenue-heading west from the Fort. Opposite the Red Fort lies Jama Masjid (Friday Mosque) made of red sandstone and white marble, completed in 1656. It is India’s largest mosque where more than 20,000 people can kneel in prayer at one time. 1730 Hrs: Arrive at Shimla, where our car and driver will be waiting for the clients and transfer to Hotel. 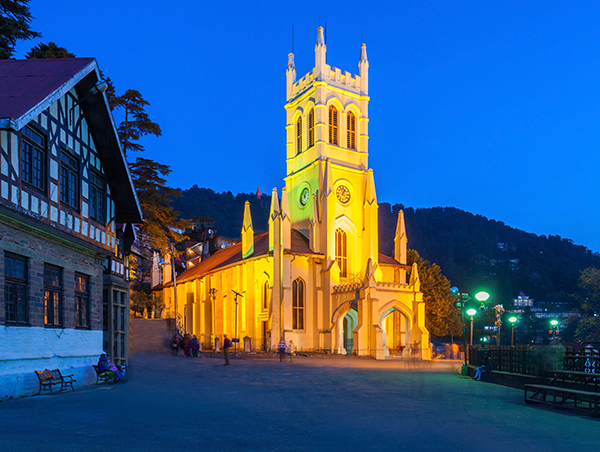 After breakfast Heritage Walk of Shimla .This soft walk will commence at the Mall and will end near Cecil Hotel – en-route admiring the important buildings consturcted during the days of the British Raj. During the Heritage walk your local guide will give you brief history of each building. After Heritage Walk visit Viceregal Lodge Indian Institute of Advanced study:- The site for Viceregal Lodge was selected by Lord Lytton the Viceroy of India between 1876 -1880. The Viceregal Lodge, also known a Rashtrapati Niwas is located on the Observatory Hill of Shima. It was formerly the residency of the British Viceroy of India. It was designed by British architect Hendry Irwin and built in the Jacobethan style during the regime of Lord Dufferin. Its construction stared in 1880 and completed in 1888. In the afternoon visit Jhaku Temple/ Hill (2455 Mts. 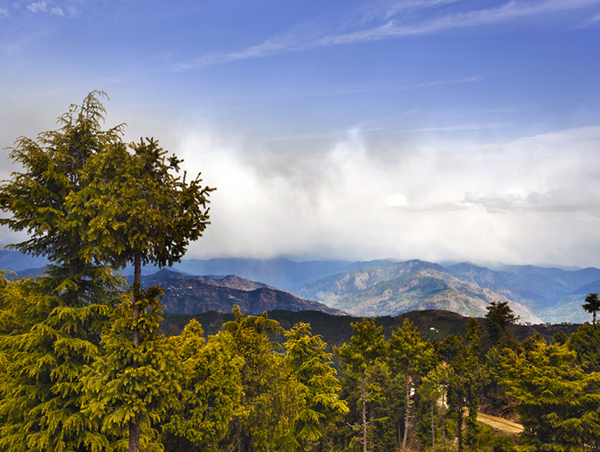 ): This is the town's highest peak and a vantage point for Shimla's famous views. The summit is crowned with a temple dedicated to monkey God Hanuman. This also offers a very good view of the Shimla with snow capped mountains. One legend goes that Lord Hanuman stopped there to rest while he was searching for the Sanjivni Booti to revive Lakshman in the Epic Ramayana. Gaiety Theatre -The Gaiety Theatre, and a tradition of amateur theatrical remains in the stump of the once colossal edifice that was the Town Hall. The architect Henry Irwin, who built the Viceregal Lodge, designed the theatre building. Upon arrival at Parwanoo transfer by cable car ride to Moksha Himalayan Spa (Located on top of the mountain) for Lunch. After lunch transfer from top of the Mountain to base of the Mountain by cable car. Upon arrival at Parwanoo and drive to Chandigarh railway station in time to board the train for Delhi. Upon arrival meet & assist at the railway station by our representative and transfer to Hotel. Today after breakfast, you will drive to Agra - medieval city on the banks of the Yamuna River. It was founded by Sultan Sikandar Lodi in the year 1506. Agra achieved fame as the capital of the Mughal emperors from 1526 to 1658 and remains a major tourist destination because of its many splendid Mughal-era buildings. Most notably the Taj Mahal, Agra Fort and Fatehpur Sikri, all three of which are UNESCO World Heritage Sites. In the afternoon enjoy city tour of Agra visit Agra Fort - Agra Fort was originally a brick fort and the Chauhan Rajputs held it. It was mentioned for the first time in 1080 AD when a Ghaznavide force captured it. Sikandar Lodi (1487-1517) was the first Sultan of Delhi who shifted to Agra and lived in the fort. He governed the country from here and Agra assumed the importance of the second capital. He died in the fort in 1517 and his son, Ibrahim Lodi, held it for nine years until he was defeated and killed at Panipat in 1526. He built several palaces, wells and a mosque in the fort during his period. And world famous Taj Mahal by sunset (Closed on Friday) - Overlooking the River Yamuna, the Taj Mahal is a classic example of Mughal architecture, with the Taj itself built as a mausoleum at the northern end of an extensive formal walled garden designed in the charbagh style and structured on the Islamic theme of ‘paradise’. Upon arrival at Jaipur, check in at Hotel. After an early breakfast proceed for the excursion to the Amber City Fort situated 130m high with the Aravalli hills around and 11 km north of Jaipur. It was the ancient capital of the Kachhawaha Rajputs till 1037. Ride the colourfully painted elephants up the hill, admire the massive gateways, courts, stairways, pillared pavilions and palaces the recall the glory and wealth of Amber’s association with the Mughals. In the afternoon visit the City Palace (still houses the erstwhile Royal family); Jantar Mantar – the Royal Observatory and Hawa Mahal (Palace of Winds, with 1043 windows) - built for the royal ladies to watch the activities on the market street below without being observed themselves. Upon arrival at Delhi, check in at Hotel. Today after early breakfast, you will transfer to Delhi International airport for your onward journey home. Meet & assist at airports/railway station & hotels by our representative.